The international beverage multinational has its origin in Cuba. The 1830 from Spain immigrated wine merchant Facundo Bacardi Massó (1814-1887) experimented with spirits and founded the small distillery "Bacardi y Compañia" with his brother José in Santiago de Cuba in 1862. He developed the recipe for the world's first clear "white" drinking rum, following a recipe that is still kept secret today fermentation produced by special yeasts, charcoal filtering and storage in oak barrels. The unmistakable trademark is a bat, in Cuba the symbol of luck. 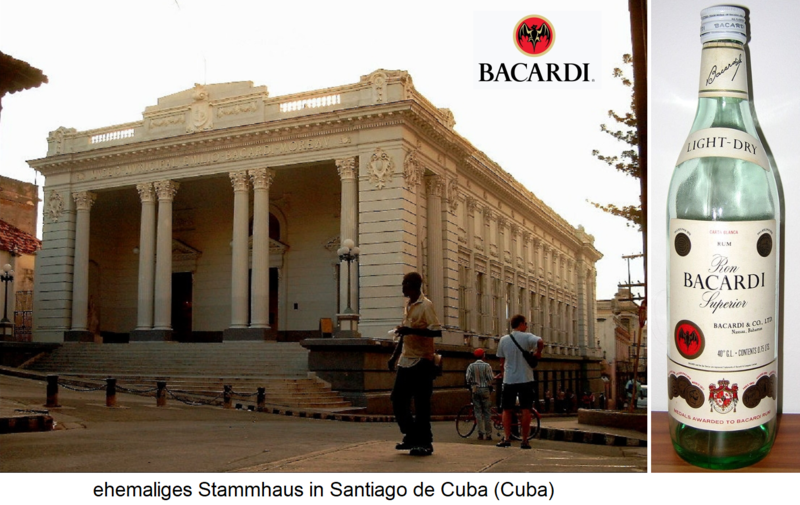 From 1872, the founding sons Emilio and Facundo Bacardi Moreau continued the company. The late 19th century was the rum well known far beyond Cuba. In 1910, the first foreign bottling plant was built in Barcelona (Spain). After the Cuban Revolution in 1959 and the expropriation without compensation a year later, the Bacardi family emigrated to the United States. But she managed to take the original Hefekulturen and keep the international trademark rights. In addition, they had foreseen the development and already taken appropriate measures. The original distillery producing in Cuba continues to market its rum under "Ron Caney" (spanish Ron = Rum, Caney = Hut). However, the most significant rum brand in Cuba is called "Havana Club". However, this name has been argued for a long time, because Bacardi claims the rights for himself. Bacardi is today the synonym for Trinkrum par excellence and the world's number 1 rum brands. There are over 20 variations of rum or rum mixed drinks; the best known are Añejo, Big Apple, Breezer, Cocó, Oro and Superior. Over time, a number of renowned spirits brands have been acquired. These include Bénédictine (spice liqueur), Bombay Sapphire (Gin), Below ( vodka ), Cazadores ( tequila ), Dewar's ( whiskey ), Eristoff (vodka), Gray Goose (vodka), Palmas (rum) and many others. The portfolio includes a total of around 200 brands. Furthermore, there are exclusive distribution rights for other well-known spirits brands. This page was last modified at 6 February 2019 at 18:59.